THE GRADE Cellars is a small producer of single vineyard, 100% varietal wines from the Calistoga District of Napa Valley. Our 12-acre Winfield Estate Vineyard is nestled into the base of Mount Saint Helena north of Calistoga and is planted 7 unique blocks of Cabernet Sauvignon each with its own distinct terroir characteristics. From this select site we produce 3 world-class Cabernet Sauvignons crafted by Thomas Rivers Brown. 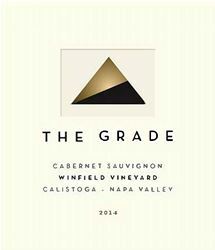 These Cabernets include "THE GRADE Winfield Estate", "KINGLY PROJECT" and "SERPENT'S BACK". The latter two are each from single blocks within Winfield Estate Vineyard. We also make "SEA-FOG" Sauvignon Blanc from a single-vineyard, 100% varietal Calistoga District fruit. Total production is limited to 1,000 cases per year. Our wines are available directly from the winery, so please contact us if you would like to make an appointment for a tasting at our tasting room "The Library" at 1236 Lincoln Avenue, Calistoga, CA or to arrange a vineyard tour. We offer tastings in our Library, which is on the second floor in a turn-of-the-century (1900s) home on the main thoroughfare in Calistoga. We can accommodate up to 16 guests in one group. Our tour of the Winfield Estate Vineyard can include a ride in our 1967 Land Rover through the vineyard with panoramic views of the palisades and upper reaches of Napa Valley. Please see our website for photos of our venues. To join the wine club, visit www.thegradecellars.com or call 707-967-8200. Our wines are made available by allocation to our mailing list two times a year, once in the spring and once in the fall. Seeing the limited production being made each vintage, we offer guaranteed allocations of our wines solely to members of "The GRADE Library". CHAPTER 1 - "ENTER THE GRADE"
CHAPTER 2 - "ON THE GRADE"
CHAPTER 3 - "TOP OF THE GRADE"
Please contact Justin@TheGRADECellars.com to learn more about the club and its benefits. We require a full year commitment to The GRADE Society to ensure you receive full benefits. After a full year you are welcome to modify or cancel at any time.